Kneeling L-R: Katelyn Hutto, Catherine Quarles, Casey Wash, Taylor Driggers. Standing L-R : Haleigh Timmons, Maggie Massey, Merissa MacDonald, Autumn Easler, Madelyn Wise, Nicole Cruz, Shelby Harter. Coaches: Alan Timmons, Paul Driggers and Chris Wise. 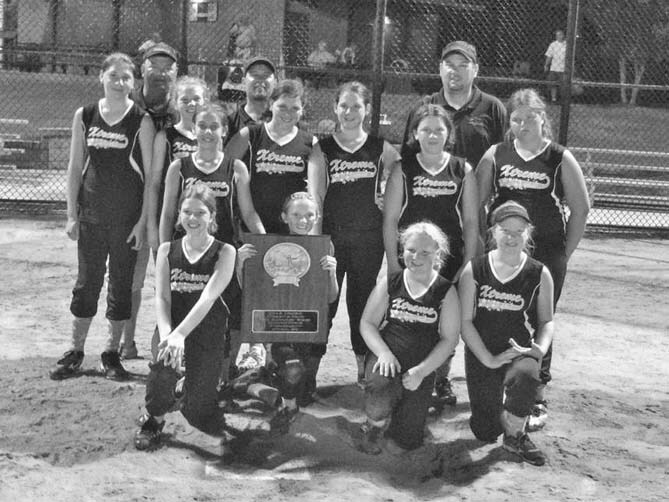 Congratulations to the Edgefield Xtreme fast-pitch softball team. They are the Champions of the USSSA Mid-Summer Blast that was held in Aiken this past weekend. This was a 1-day event and the girls had to play 7 games that started at 9:30 Saturday morning and didn’t end until 10:30 that night. Xtreme won the championship after coming off of a runner-up finish in the WFC Summer Sizzle held in Barnwell SC the weekend before. They competed against teams from Columbia, Aiken, Charleston and Savannah as well as other towns throughout the state of South Carolina and Georgia. This is a great accomplishment for this young team and it is only their fourth tournament.